Stylish rooms in historic centre. NOTE: Breakfast not included - but many bars in the immediate vicinity. Arrive in Pitigliano: Dramatic approach to Pitigliano on foot (1 mile) via 2,500-year-old Etruscan lanes is strongly recommended. Alternatively this walk can be done as an excursion after arrival (2 miles). Pitigliano to Sovana: Free morning to explore crag-top Pitigliano, its Etruscan houses, medieval fortress and synagogue. Then follow an Etruscan lane to a small plateau, with pastures and vines, to the charming village of Sovana (4.9 miles, 2.5-3 hours). Pitigliano to San Quirico: From Pitigliano, follow an Etruscan lane to a small plateau, with pastures and vines, to the charming village of Sovana with its fine Romanesque churches (4.9 miles, 2.5-3 hours). Optional walk to see the outstanding Etruscan necropolis, including the Tomba della Sirena, restored by the ATG Trust (2.5 miles). From Sovana, paths across farmland lead to a fine Etruscan lane that descends into a gorge, from which rises crag-top Sorano. After exploring Sorano, paths along the gorge lead to the troglodyte habitations at Vitozza and village of San Quirico (10.3 miles, 5.5 hours). Palazzo in town centre. Superior route has superior rooms. Free day in Sovana: Visit Sovana’s fine Romanesque churches. Walk to see the outstanding Etruscan necropolis, including the Tomba della Sirena, restored by the ATG Trust (2.5 miles). Sovana to San Quirico: Paths across farmland lead to an isolated church and fine Etruscan lane that descends into a gorge, from which rises crag-top Sorano. After exploring Sorano, paths along the gorge lead to the troglodyte habitations at Vitozza and the village of San Quirico (10.3 miles, 5.5 hours). San Quirico to Bolsena: Cart tracks across farmland lead to an escarpment, where paths descend towards the small town of Latera. A climb through chestnut woods to the rim of a volcanic crater offers superb views. Tracks lead down to Lake Bolsena (10.4 miles, 5.5 hours), from where a private boat takes you across the lake to Bolsena (town). Optional exploration (by boat) of Lake's unique features (weather permitting). Free day in Bolsena: Explore Bolsena, its ancient streets, castle, Etruscan temples and church, and catacombs of Santa Cristina, site of the miracle of Corpus Christi. Swimming in the lake. 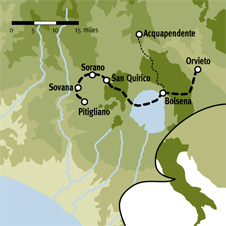 Optional walk from Acquapendente through the low Monti Volsinii (12.2 miles, 6 hours). Bolsena to Orvieto: An old Etruscan lane leads up through woods to a plateau and across farmland. The first view of Orvieto, situated high on its extinct volcano, is unforgettable (10.7 miles, 5.5 hours). Don’t miss the magnificent cathedral with frescoes. Dirt roads, farm tracks and mule paths across hills and plateaux, and through gorges. This fitness level for this trip is Grade 2-3. Local specialities for this part of Umbria, Tuscany and Lazio include acquacotta (a rich tomato based soup), sweet Maremma lamb, wild boar and other game; dishes influenced by an ancient Jewish tradition in Pitigliano; and fresh fish, including the regionally unique coregone and eels, from Lake Bolsena. Morellino di Scansano, a fruity fullbodied DOC red and Bianco di Pitigliano DOC fragrant dry white, often aged in Etruscan caves below the town. Orvieto Classico DOC needs no introduction. Local wines including Est! Est!! Est!!! from Montefiascone. In Sept 2013 I did this walk on my own. I have been to Italy before but this was the first time I had travelled on my own and that I had 'walked'. I loved every moment of it. The villages were more wonderful than I imagined, perched on their crags. I stayed an extra night in Pitigliano and was so pleased I did (amazing lightening show one night). Sovana was tiny but delightful. Bolsena a lovely surprise. I had visited Orvieto before was more special walking towards it on the old Roman road. The 'caves' (mainly in the first three days) were very atmospheric, one moment you were in open, hot fields, the next in damp sculpted cravasses with pink cyclamen glowing amongst the moss. My route booklet was great to follow and is now a keep-sake, filled with my scribblings (wonderful meals I ate - cinghiale (wild boar) pasta, roasted corregone (local fish) at Trattoria da Giggetto on Lake Bolsena; eating wild blackberries, seeing rabbits and deer, wandering through vine-yards and orchards). Although on my own (and passing hardly any-one on the track) I felt very safe and was blessed with great weather. I chose mainly for the Etruscan ruins and history but the villages and scenery were the star (and food and wine of course!). I've been to Italy many times but this area was a revelation. There were so many points of interest on this trip - each day was a new and different adventure. We really enjoyed the trip. Beautiful and varied scenery. A wonderful end to our summer, thank you. We had a wonderful walk overall for our first walk in Italy. Varied and very interesting! A challenging and most satisfying 5 day hike. Loved every moment, the walk, the history and the beautiful towns we visited. Always will remember this time. Beautiful medieval towns and interesting sites. Nice walks. 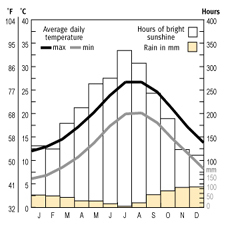 Meteorological records for the area, taken over a period of more than 10 years, are represented in the Weather Chart provided with each itinerary. Early in the spring it can still be quite cool and fresh with bright days and dewy mornings, and it can rain. From late spring through September days are very warm, with the possibility of swimming in Lake Bolsena. In October it is cooler and fresh, with bright days. Again, there is a possibility of rain. This fitness level of this walking holiday is Grade 2-3.The terrain for this walk is a mixture of hills, plateaux and gorges. We walk mostly along farm tracks and unmade roads but also use sunken Etruscan roads (! ), which can be steep and occasionally slippery (mossy). We walk through fertile arable land and past vineyards, along narrow wooded valleys and over the hills of an extensive volcanic area that incorporates Italy’s largest crater-lake, Bolsena. There are no vertiginous walks. 8-day: Walks are offered on 6 days (or 7 with optional approach to Pitigliano). 5-day: Walks are offered on 3 days. The walk lengths vary from 3 hours to a maximum of 6 hours walking. Hours of walking, which may vary from individual to individual, means hours of actual walking and does not include stops for lunch, sightseeing or rests.On certain days our paths may cross rugged terrain - please make sure that your footwear provides sufficient ankle support. The recommended destination airports for this route are Rome Fiumicino and Rome Ciampino. The routing of your journey to Pitigliano depends on the day/time you are travelling and whether you plan to stop in Rome before heading to Pitigliano, via Orbetello. The fastest route to the centre of Rome is the Leonardo Express. Trains run very frequent services 7 days a week to Roma Termini station. Journey time 32mins, €14. However you are travelling directly to Orbetello from the airport, you are better off taking the train to Trastevere station and changing for onward services to Orbetello. Journey time 2- 2.5hours, €18. Check timetables and prices at www.trenitalia.com. From Rome Termini Station: Take a train to Orbetello. These run quite frequently and take approx. 2 hours (cost €10-€15). From Orbetello station you can take a bus to Pitigliano which costs approximately €7, however departures are infrequent (4 per day). The bus journey takes 1 hour 30-40. For some departures you need to change in Albinia. For up to date bus schedules please refer to http://www.tiemmespa.it/ . Tickets can be bought in the station shop. Directions to the first hotel from the bus stop in Pitigliano can be found in the route book. Alternatively a taxi from Orbetello to the first hotel will cost from €120. We can book you a taxi from Rome Fiumicino or Rome Ciampino airport to the first hotel. The taxi holds 3-4 passengers (depending on luggage), takes approx 2 hours and costs from €220 (€250 for a van). Prices may vary at weekends, Bank Holidays or late at night. •If you change your flight please notify us on 01865 315678 so we can contact the taxi company to reschedule the taxi for you. •If, on the day of departure, your flight is cancelled or you miss or change it, please immediately contact the ATG emergency number 01865 315600 so we can contact the taxi company to reschedule or cancel the taxi for you. •If your flight is delayed and you have arranged for the taxi to meet you at the destination airport, your taxi driver will wait for you. •If you are delayed and you have arranged for a taxi to meet you at a non airport location (e.g. a train station) it is essential that you contact your Route Manager or call the ATG emergency line to notify us at the earliest possible moment, so we can contact the taxi company to re-schedule or cancel the taxi for you. •Please note that failure to advise ATG that you cannot meet the taxi booked for you may result in the taxi costs being passed back to you. The Hotel Guastini in Pitigliano has a private garage where you may leave your car for €15 per day. This must be pre-booked via the ATG office. feature strongly, preferably cooked on an open fire. This is country food and even the most elegant restaurants serve rustic terracotta bowls of rich vegetable and bean soups, of which the local version in this area – often tomato-based and featuring a poached egg - is called acquacotta (literally ‘cooked water’!). In Bolsena (Lazio) we eat fish from the Lake, whilst Umbria is famous for producing some of the tastiest salami in Italy and offers the unexpected addition of fresh trout to the menu, caught in the nearby mountain streams. 1966 and is aged in Etruscan caves, and Orvieto Classico, a golden-coloured wine which dates back to the Etruscans. In addition, we drink Tuscany’s newest DOC wine - the Morellino of Scansano and try the anecdotally renowned white Est! Est!! Est!!! from Montefiascone. The recommended airports for this tour are Rome Fiumicino and Rome Ciampino. From both airports there are frequent connections to central Rome, from where there are regular trains to Orbetello (2 hours, €10-€15). From Orbetello there are bus connections to Pitigliano (4 per day, 1 on Sundays), journey time 1.5-2 hours, ~€7). Taxi to the first hotel: From Rome airports ~€220; from Orbetello ~€120. Prices may be significantly higher on Sundays and public holidays. Taxis can be booked via the ATG office. For more detailed travel information see Frequently Asked Questions below.